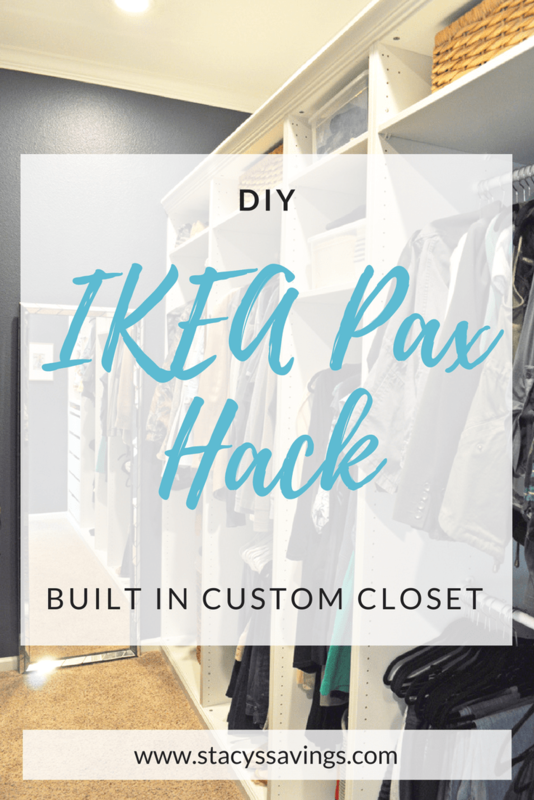 IKEA Pax Built In Master Closet Reveal! 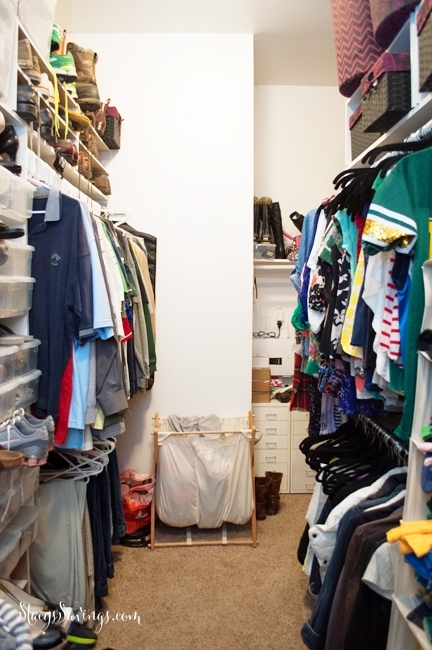 When we bought this house, the master closet had so much potential. It’s easily the biggest closet I’ve ever had. 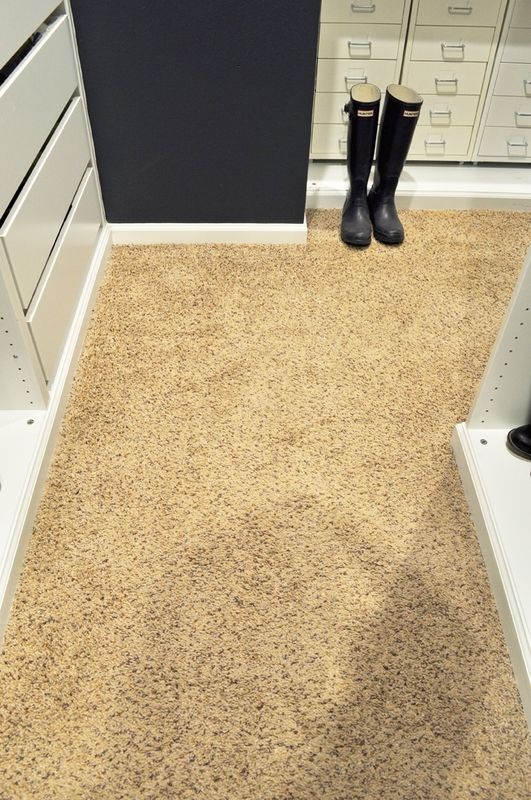 It is a deep walk in, but the builder-grade basic shelving wasn’t taking advantage of the available space. I knew I could make it way better, and I had originally been planning on using the IKEA Pax System as a built in solution for this closet in the first year we lived here. But, life happened and the Master Bathroom turned out to be more than I had budgeted for, so this project got shelved, so to speak, until 2017 – our third year in the house. In 2016, I read Marie Kondo’s The Life Changing Magic of Tidying Up, and I started implementing that with my clothing. I’d also been saving up money at the same time so that I could pounce on the IKEA Pax sale. That sale happened in late January 2017, so we headed up to IKEA to purchase all of the wardrobe materials. 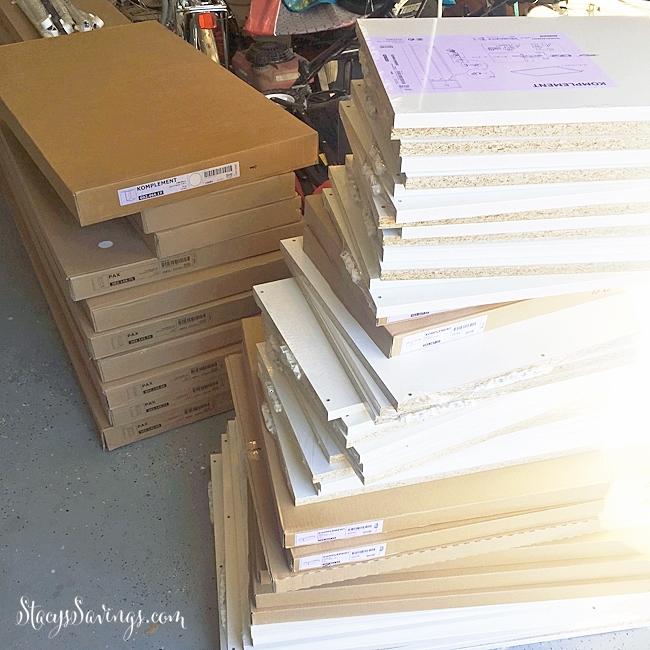 Over the course of the next two months, we demoed the master closet, painted, added subfloors to the slab to accommodate future hardwood flooring, built wardrobes, installed them, trimmed them out, and added the accessories. When you last saw it, the wardrobes were in and the closet was functional. Since then, we’ve trimmed out the wardrobes with base molding all around the master closet and crown molding on the wardrobes to give it that built in look. I also finished my vanity space which I showed you last week, and hung up a framed pic of my kids. Yes, I’ve been searching for artwork for my master closet for a year, and hadn’t found anything I liked. So I put up a pic of my kids at the beach. I love the mirror at the end of the closet. I’ve never had a full-length mirror before. This one is from West Elm, but its no longer sold. I absolutely love this closet! 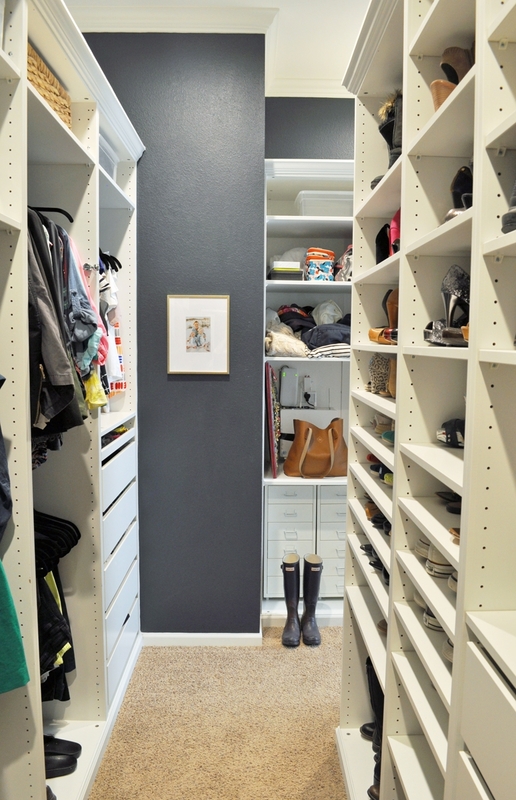 It is the master closet of my dreams! 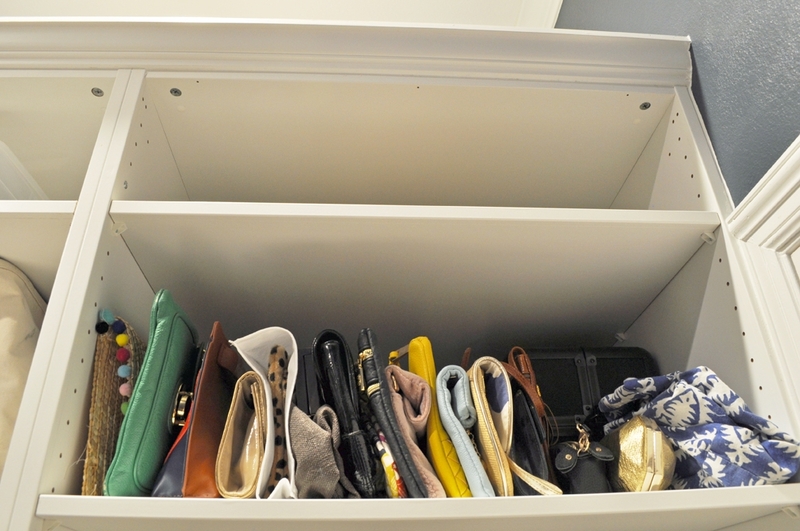 One of the things that I love about this closet is that I have specific space for each type of item. It really keeps me from overspending or buying something that doesn’t truly spark joy. For example, I only have so much space for shoes. If I want to buy a new pair of shoes, I need to get rid of a pair I don’t wear anymore, because I just don’t have the extra space. I love that! The shelves are all adjustable, so if my future needs are different, I can just add/eliminate/move shelves. 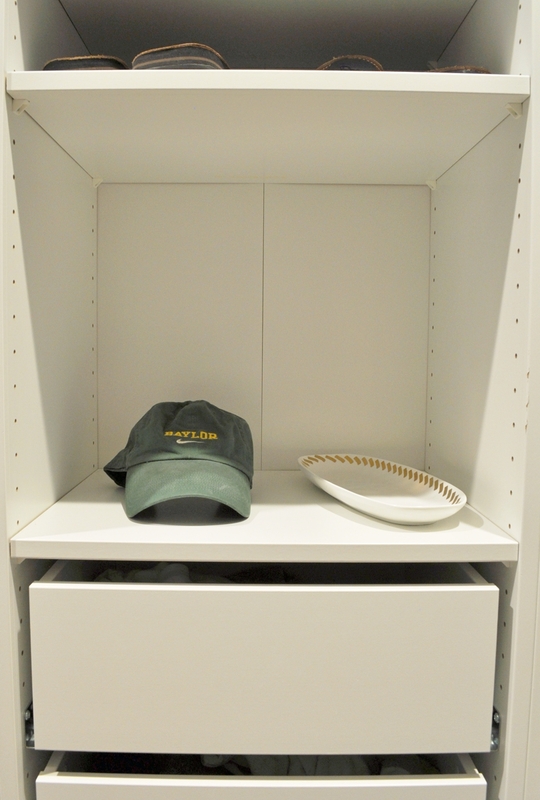 Everything that I wear is in this closet. I’ve been able to empty my dresser in the master bedroom. I’d love to be able to get rid of that huge dresser, but right now, we’re using it for our daughter’s clothes so we don’t have to go upstairs. My husband hasn’t fully embraced the closet yet. He refuses to Konmari his clothes, to file fold, to use the velvet skinny hangers. He also refuses to move the rest of his clothes from the dresser in our room to his set of shelves in the closet. He’s just a fuddy-duddy. But, he just took a new job at his company, and now he has to go to the office. So he needs new clothes. I told him we couldn’t go shopping until he went through his closet. We’ll see. Maybe he’ll convert. I love the Pax system. It was so easy to use. There are a ton of different ways to configure it to fit your needs. 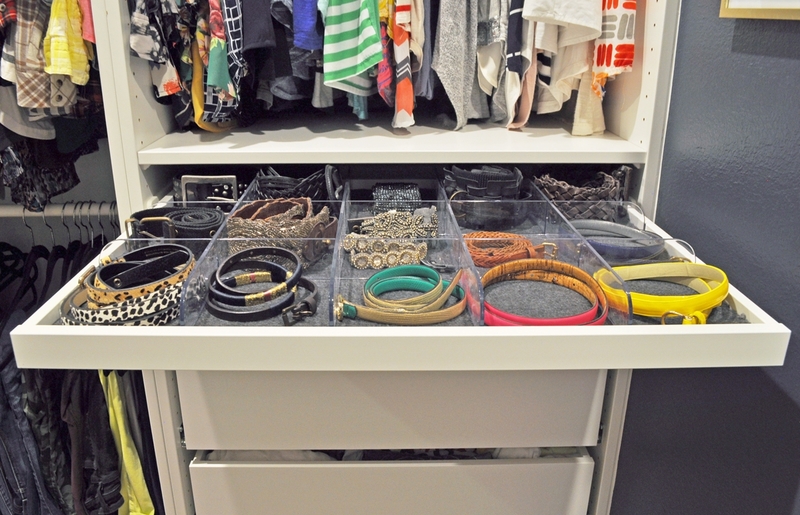 I love all of the different interior organizers, and if I want to change something, I just need to take a trip to IKEA. It was easy to make the Pax look built in. Caulking where the Pax touches the wall helps, but the biggest impact is running the baseboards straight from the wall to the Pax. Someday, I might put a more built-in, separated hamper solution, but for now, this hamper from HomeGoods is working really well for us. My accessories area isn’t perfectly organized, but most things have a space. 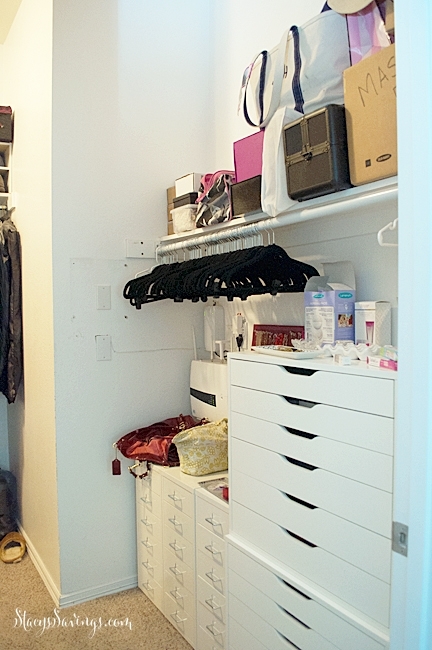 The LED can lights make this closet so much brighter than it was before, especially adding that third light. 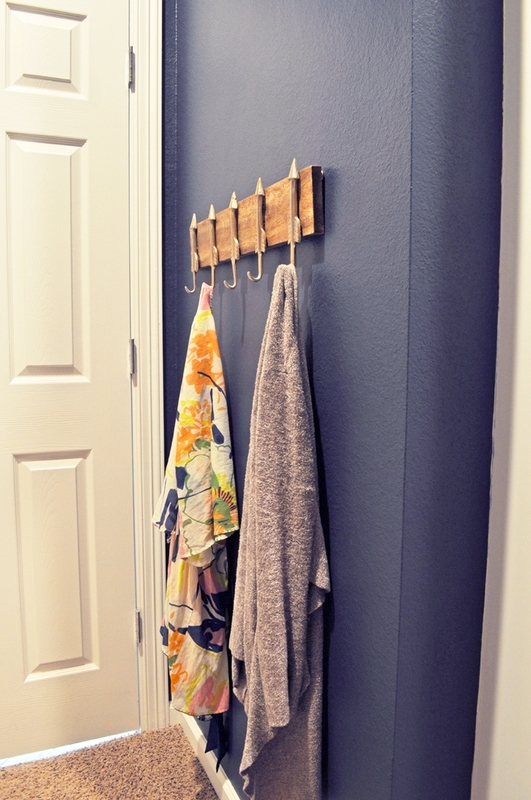 I love having a place to put my Barefoot Dreams Cardigan that I throw on every single day. As far as the little projects that I have yet to do, some are easy and some are difficult. 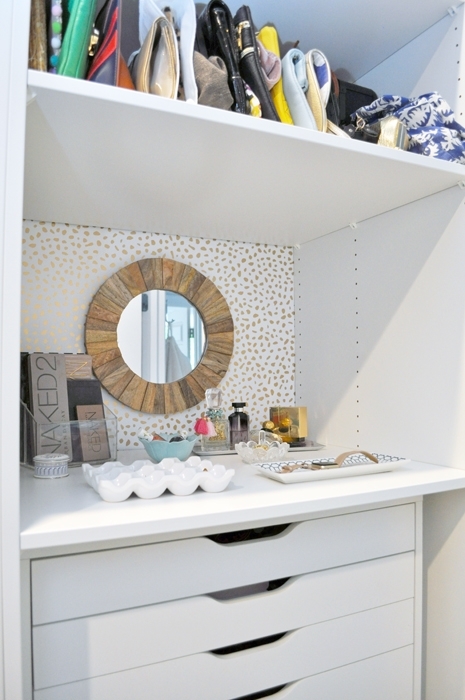 Lining the drawers with the polka-dot wallpaper from the vanity area is easy. Building a custom shelving area next to the alarm box is harder. 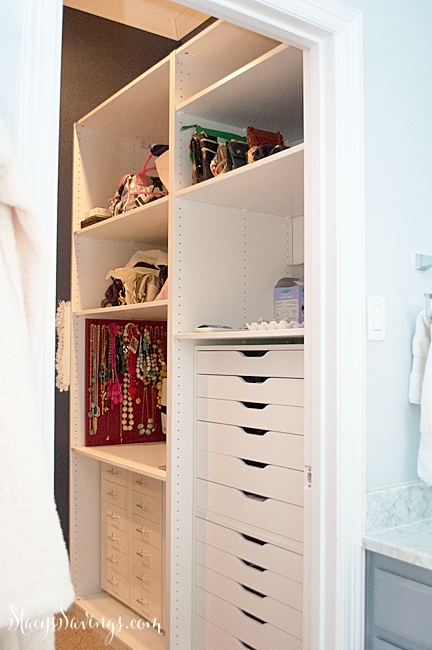 I also want to make some sort of dividers for the drawers, and some DIY jewelry organizers to hang from the wall. Oh and add wood floors someday. We have yet to put anything on top of the wardrobes, but I painted and built up the tops to the top of the crown so that it was one flat plane. I’d love to put our luggage up there, as well as out of season clothes in my favorite clear Container Store boxes that I have in different sizes all over the closet. 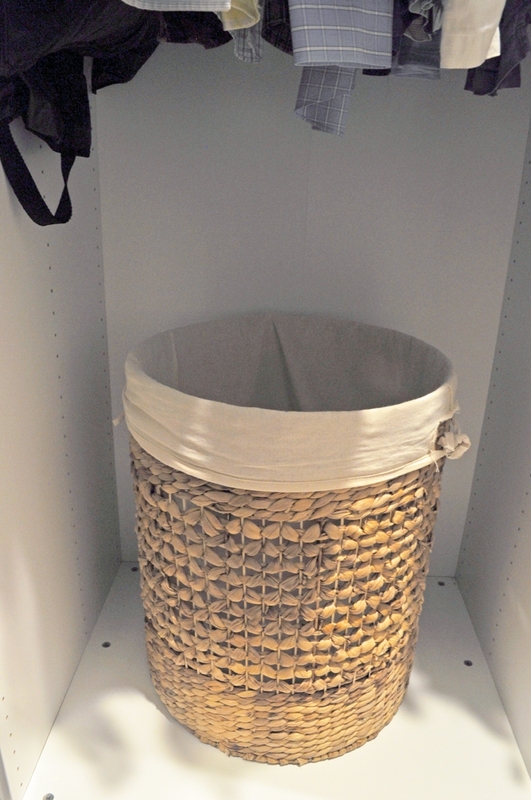 The baskets at the top of the closet are from World Market. The gold picture frame on the wall is from Target, as is the speckled peel & stick wallpaper in the vanity area. 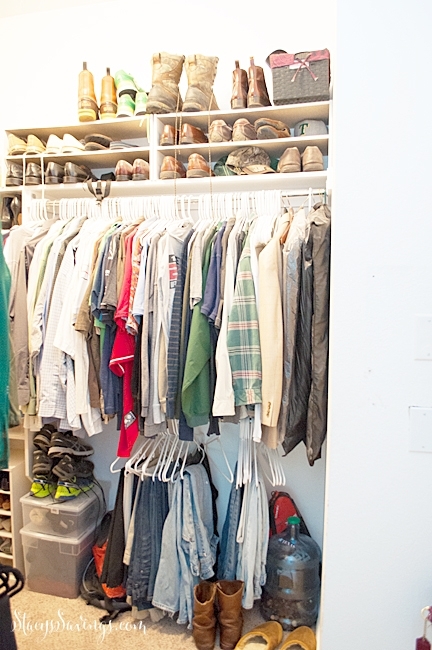 I love getting dressed in the morning, and its so much easier with everything I need in the same space. The Valet Rods were a wonderful addition. I ordered these chrome valet rods from Build.com, and they were easy to install in the Pax wardrobe. This is the one thing I highly recommend, even if you can’t swing a full remodel. Valet Hooks are game-changers, and they don’t cost much money. I could have mounted these on my old builder shelves. I even squeezed in my 3 IKEA Helmers for my nail polish & treatment storage, as well as the 2 Alex drawers that I use for beauty and jewelry storage. Let’s look at some befores & afters! The closet checks off all of the boxes. It’s functional, its optimized, and its pretty! Building it this way, with the PAX system, and trimming it out to look built in saved us a ton of money over other custom closet solutions. 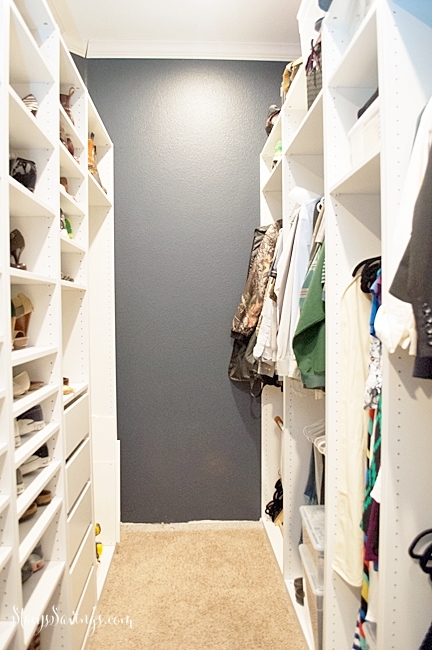 All together, we spent almost $2,000 on everything to build this closet from scratch. I don’t think I could have gotten this result any cheaper than that. It definitely pays to wait until the PAX sale at IKEA to save 15%. 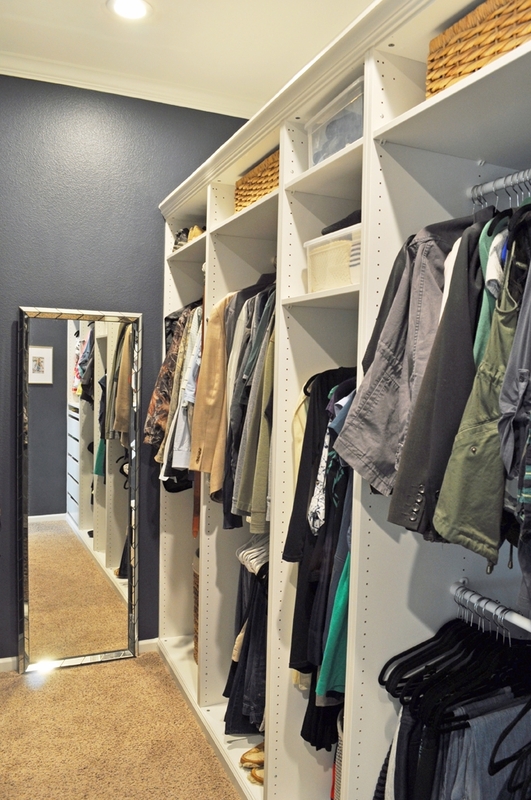 Have you remodeled your master closet? 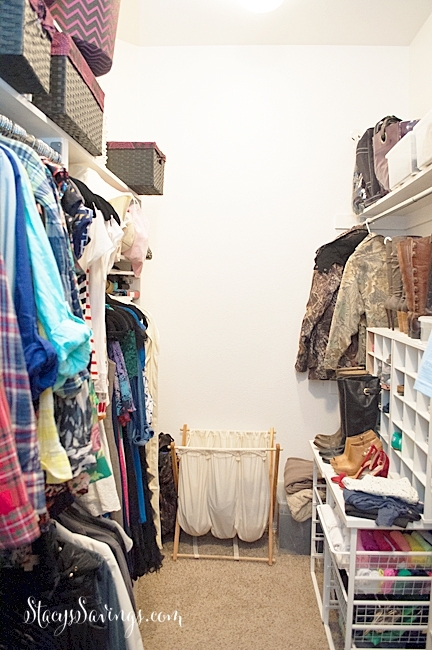 If not, what’s on your list for a dream closet? I’d love to hear your thoughts in the comments! 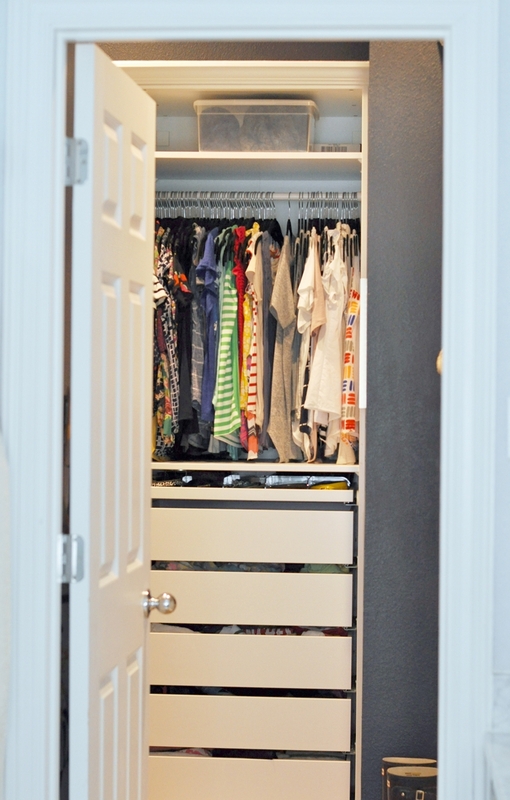 Make sure you see all of the other budget-friendly closet renovations that I’ve done in this house, including my son’s closet, my girls’ shared closet, and the awkward closet under the stairs. There’s only one closet that remains untouched by me. I wonder how long that will last? I’m linking to the Thrifty Decor Chick Before & After Link Up! Wow it looks amazing!!! 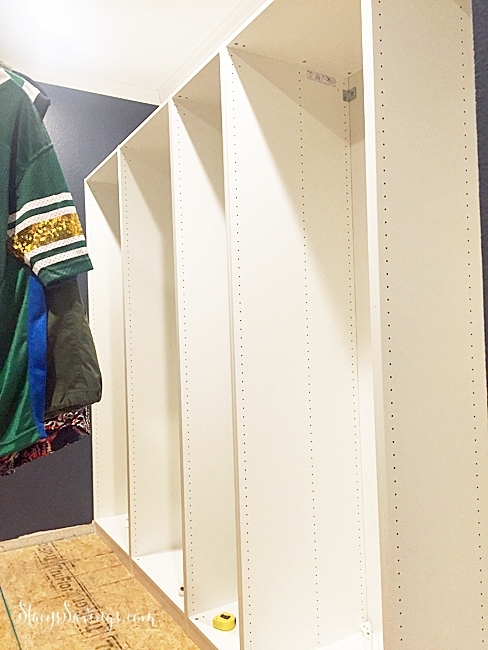 I need a closet like that! I love all the shelving you put in, and it is so organized! Thanks! 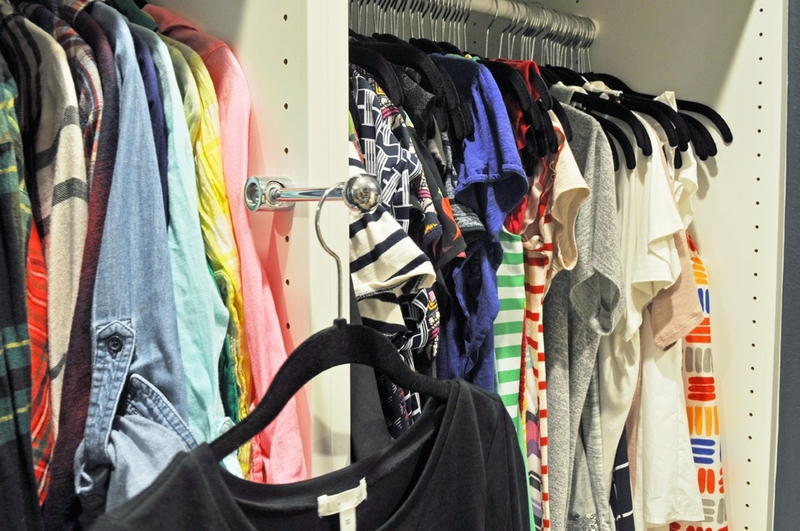 You could totally do this in your closet! Just a quick trip to IKEA! 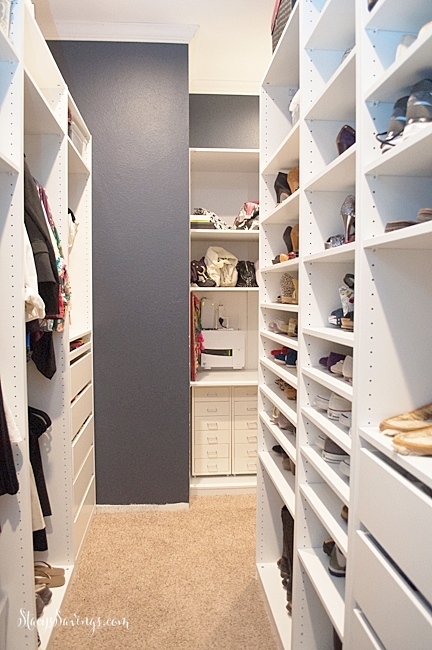 I am obsessed with your new built-in master closet! I need one for myself! I love how organized everything is! Thanks! Once upon a time I told my son that it was going to be my club house, and we could have a pizza party in there. Like a Mom Cave. Still haven’t done that. But, it is our Tornado Shelter! Oh my! This transformation is just outstanding! There is a place for everything. My favorite part is the area that I’m officially calling the “beauty counter” with the perfumes. I just love it. Nicely done. Thank you! You should see all of the makeup in those drawers underneath that. 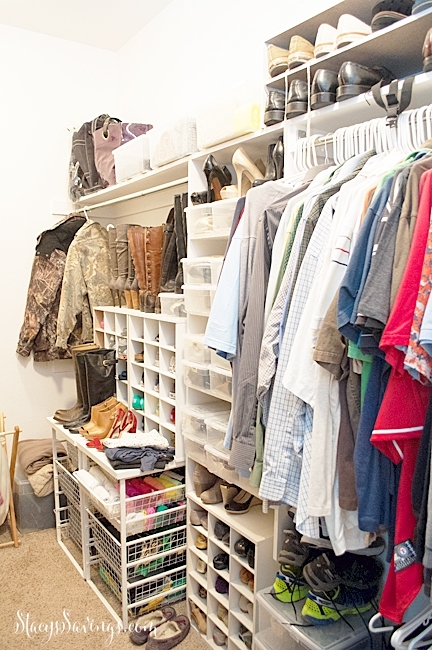 Organizing that is on my list for the Fall. Wow, you did such a great job! We just bought our first house and I can’t wait to redo the master closet! I’m planning on using this Ikea system too. Congrats! You’ll love it! It’s so easy to customize, and even easier to make it look built in! I’m actually about to start helping my neighbor design hers. Have fun! Oh Wow! I absolutely love love LOVE the transformation! 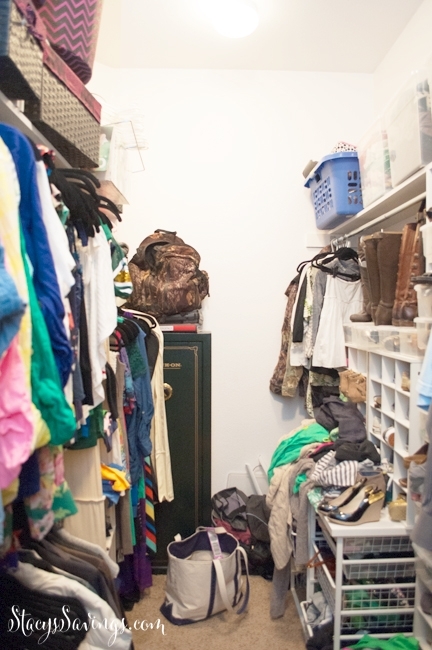 You have such a big master closet and everything has a place. You can never go wrong with Ikea 😉 I really like you added the gold polka(ish) dot background that really adds something to it. Great job! Thank you so much! 3 years of planning went into that closet, and we really love it! 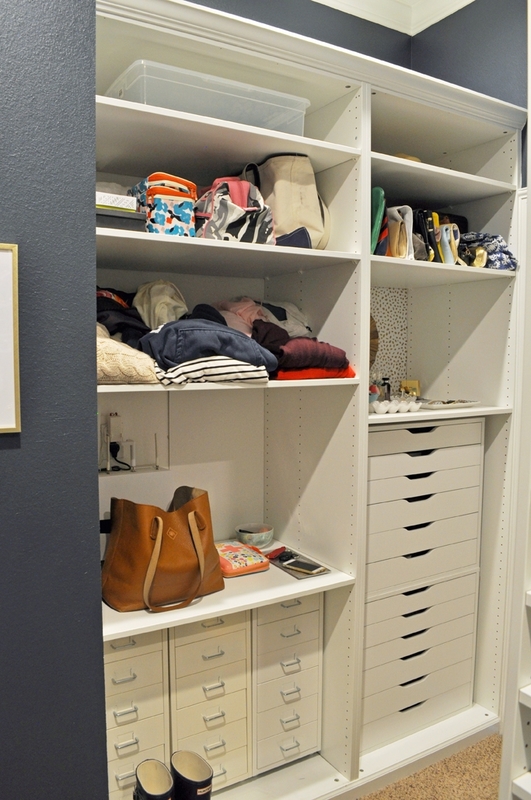 Stacy, love the work you did and it has inspired us to do our closet. We do not have an Ikea store so we would have to shop online. Can you tell us what the Pax system is made of and how durable it is? Thanks for your help! The Pax is made of particle board with coating on it, like the kitchen cabinets. We haven’t had any problems with it. How close is the nearest IKEA? What about a road trip? That shipping is probably a nightmare!